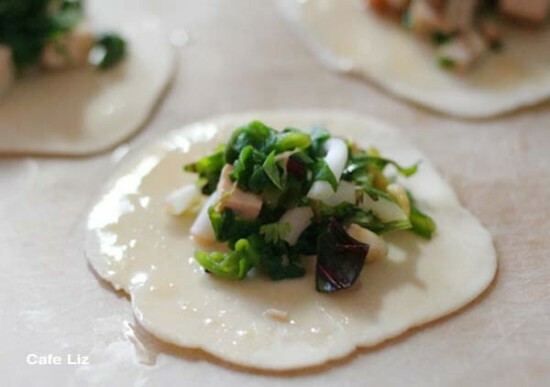 There are lots of gorgeous recipes for potstickers online. The problem? Most are filled with pork, or shrimp, or a combination thereof. There’ll be none of that here. I was inspired to make these dumplings after viewing some beautiful potsticker photos, and was inspired to create some fillings based on the wonderful assortment of vegetables in our fridge. 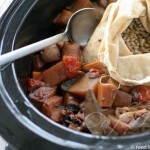 More of my vegan recipes. 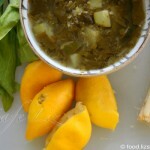 I filled half with a mushroom-ginger filling, and the other half with a garlicky mix of greens and bean sprouts. Quite good indeed. I should note that I decided to make my own dumpling wrappers (it’s actually quite hard to find suitable premade wrappers around here) so from start to finish, the cooking process took me two hours. That’s a little long for a lunch, but it was fun. The filling quantities below are each enough for about 15 potstickers, but if you have leftovers, you can just eat it as a salad, or stir-fried. Finely chop all the ingredients. 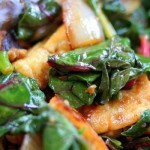 Heat the spinach and the beet leaves in the microwave for a minute, so they lose volume. Drain well. Mix everything together, draining out any extra liquid. Finely chop everything and mix together. Use either premade dumpling wrappers or make your own as follows (for about 15 dumplings): Mix 1 cup flour with 1/4 cup + 1 tablespoon water, enough to make a stiff dough. Knead until consistent, roll out into a 1-inch (2.5 cm) tube, and let sit (I let mine sit while I made the filings). Slice the tube into 1/4 inch (7 mm) discs, and roll each disc flat, until it’s about 3 inches (8 cm) in diameter. Flour lightly. This only sounds quick. 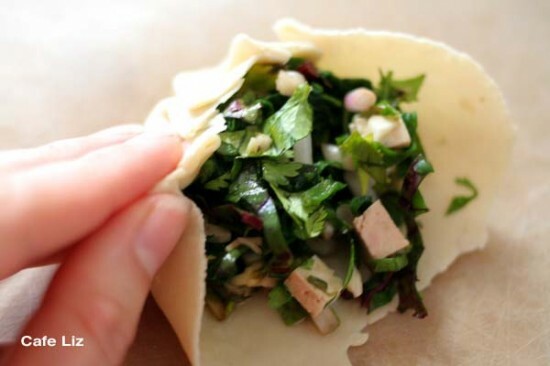 Put a small spoonful of filling into your dumpling wrapper, and close by making a few gathers on one side of the wrapper, before you pinch the other side against it (In the photo – I should note that it’s easier to close the dumplings when the wrapper is actually round. The one in the photo ripped). Use a bit of water as glue. The proper way to cook these dumplings is to put them in a frying pan with oil, fry for a few minutes, dump in some water, cover, let steam until the water is gone, and then fry for a few minutes more. I tend to skip the water part, but I think it gives the dumplings a nicer texture. For the record. 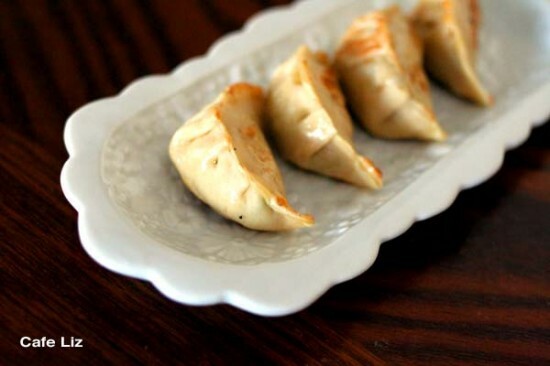 10 Responses to "Vegan potstickers"
Hey Liz! I just made the potstickers with the mushroom/tofu/ginger filling and they were delicious! I will be making them again soon. Even my boyfriend who is a meat-lover enjoyed these! Thank you for the wonderful website and recipe! Thanks, Schmooot! No reason they shouldn’t be good for you. If you don’t want to use a microwave, you’ll have to reduce the greens some other way, such as by steaming them or quickly pan-frying them on the stovetop. However, I’ve read various accounts that say vegetables retain the most nutrients when steamed in the microwave … so, up to you. I am also a vegetarian and my body has never been in a very good shape. Being a vegan can really make you much heathier. Mmm, thank you for the dumpling wrapper recipe! I always buy wrappers but I would much rather make them. I guess I need to make some soon, now! Enjoy! They wrappers are not complicated, just time consuming. can i just steam them in a steamer without frying or will it not work right? Also, do you *have* to reduce the greens, can you just put them in and wont they just cook while they steam in the dumpling? Hi Kim, you probably could steam them without frying them first. Reducing the greens makes a difference because they can lose as much as 90% of their volume — if you were to fill the dumplings with raw spinach and then cook them, you might find that they’re almost empty once cooked.